AOL has agreed to acquire Gravity, a Los Angeles, Calif.-based technology company which aims to improve content discovery through vast reams of user data. According to The Wall Street Journal, the deal is for at least $83 million. Gravity, founded by former MySpace executive Amit Kapur, touts itself as a leader in the movement toward a more personalized Web experience. 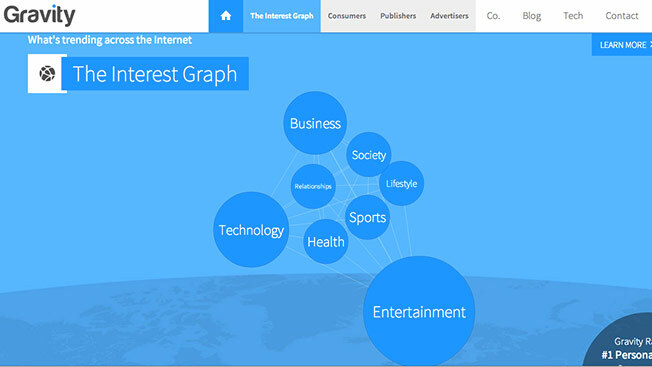 In describing Gravity's technology, Kapur has said that Web users have unique interest graphs that can be leveraged—through automated technology—to help them find more content that interests them. That's good for Web publishers theoretically, because more relevant content means they'll spend that much more time clicking on articles, photos and videos on a particular site. The same is true for advertisers, who are also in the business of producing more Web content these days. To date, publishers like TechCrunch, Sporting News and Wetpaint have all incorporated Gravity's tech, as have brands like Gap and McDonald's. Wetpaint editors credit an extra million page views to Gravity. AOL plans to use Gravity on its sites to provide a more customized experience for each visitor, hopefully driving engagement. The company also plans to lean on Gravity to help advertisers reach more of their target audiences, said officials.